Semi Solid of the Month! Yarn & Project Bag Combo! DYED TO ORDER! Choose your base yarn from the drop down menu! 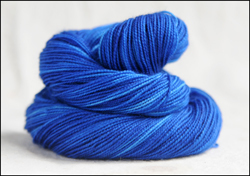 Now that we offer 4 base yarns, we thought it'd be fun to try a 'Dyed to Order' system. 4) Glitterful!! Our 2ply Sparkle Base Yarn. 75% Superwash Merino 23% Nylon, and 2% Stellina Sparkle. Perfect Semi-Solid colorways to add to your striping socks, or pick a differant, coordinating color for extra interest! This colorway is "Deep Blue"
Hand Washing and Drying recommended! One 50g skein will work for the heel and toes for an average size pair of socks.